this is an awesome upgrade of the commando arcade picture. Really nice rework, shows what can be done in NUFLI if you got a person masochistic enough to fix stuff up on the real hardware with a joystick. Was really nice to catch up with you, Daniel. I unfortunately voted it really low as I had no idea it was reworked to nufli :( It looks splendid in higher resolution. Ahhh, a NUFLI, the C64's scene's unequivocal, go-to graphics mode! Now that's what I'm talking about. 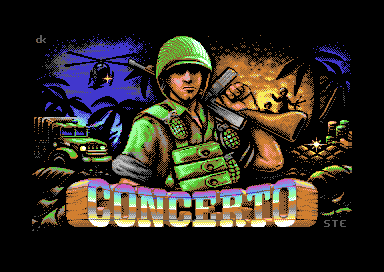 Reused from Commando Arcade titlepicture with a new logo and all in NUFLI, it seems. Why does it say "concerto"?